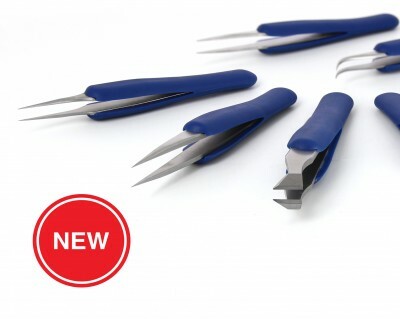 Ideal-tek is excited to launch our new ESD SAFE BLUE RUBBER GRIP TWEEZERS. - Handle color is Ideal-tek BLUE and consistent with our Ergo-tek cutter & plier line for easy identification. In addition to wear resistance, Ideal-tek DR handles are resistant to chemicals, acids, detergents, soaps, grease and fuels. These tweezers are ideal for clean room environments. NOTE: Ideal-tek light blue handles have been discontinued and replaced with new enhanced BLUE handles.